If Dang district which possesses Gujarat’s only hill station Saputara is part of Gujarat today, it is only due to sincere efforts by two brothers – Ghelubhai Nayak and Chhotubhai Nayank. 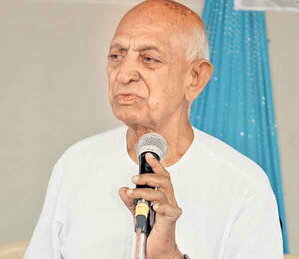 Ghelubhai passed away today at the age of 91. In late 1950s, the central government led by Jawaharlal Nehru had almost finalized Dang’s accession with Maharashtra. This decision shocked Ghelubhai and Chhotubhai Nayak who were sent to Dang by Sardar Patel to serve tribal people in 1948. Jawaharlal Nehru personally was of opinion to merge Dang with Maharashtra. To challenge his decision, Ghelubhai and brother Chhotubhai initiated number of efforts. They started teaching tribal women to wear Gujarati saree and introduced Gujarati bhajan, duha, chhand to them. But only ground efforts were not enough, as Jawaharlal was a key person, and it was important to convince him. Ghelubhai and Chhotubhai went to Delhi at least seven times to convince the centre that Dang should be in Gujarat. Ghelubhai just couldn’t utter a word in response. Jawaharlal looked somewhat softer, and he didn’t respond. This made Nehru somewhat soft towards a movement to keep Dang in Gujarat. Nayaks didn’t stop here. They started Gujarati schools in Dang within a month. As ground efforts were equally necessary to keep Dang in Gujarat, they ensured that Gujarati panel wins the first elections of Dang in 1957-58. They got success when Gujarati panel won with 86% votes. Nayaks met Nehru post elections.